Regardless of the weeaatther out theeere this February we still want to keep you informed and up to date with the newest announcements – this is for the bigger kids! ATTENTION 600 LIQUID SLED OWNERS WITH YOUTH RIDERS AGES 13-17 YRS. OLD & WHO WANT TO RACE – AMMC Racing has made a way for you! FIRST NEW CLASS: We now offer a 0-600 Jr. Liquid Class BUT you MUST be between the ages of 13-15 to be on a 600 (race director approval required for age 12 going on 13). 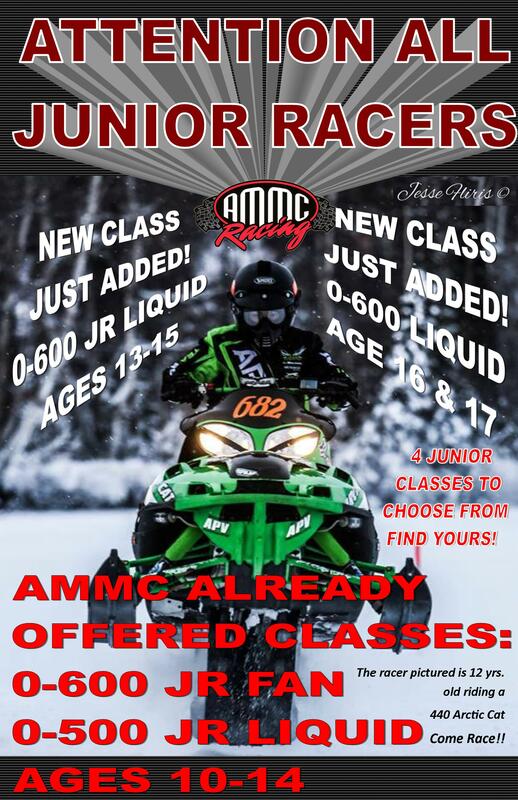 SECOND NEW CLASS: The 2nd class we are introducing is a 0-600 Liquid Class just for our 16 & 17 year old snowmachine enthusiasts out there who have NEVER raced and would like the chance to break in and to see “whatcha got”. This class will be a great class to determine if you are ready for Semi-Pro or need a season to break in. All Junior Classes are $30 to enter and are a trophy class for 1st, 2nd & 3rd Place, plus any sponsored prizes. Classes we will continue to offer for ages 10-14 are the 0-600 Junior Fan & the 0-500 Liquid Class. That’s 4 classes in all, so no excuses, get your race on with AMMC Racing! !